FBPE Executive Director Zana Raybon answers questions from students attending the FAMU-FSU College of Engineering STEM Career Day in the fall 2018. Civil engineering students at the University of Florida learn about licensure during a presentation last fall. 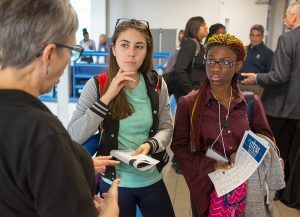 Students in an introduction to engineering class at the University of North Florida School of Engineering pick up FBPE handouts following a presentation there in March 2019. As the spring school semester nears its end, it’s a good time to look back at FBPE’s outreach efforts. 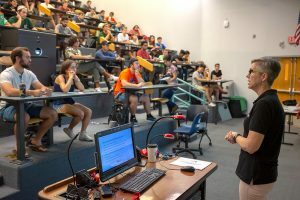 For the 2018-19 school year, FBPE staff have made 17 presentations to university engineering classes or groups, and volunteered at the annual Florida Mathcounts state competition and the 2019 ASCE Southeast Student Conference/AISC Steel Bridge Competition. During presentations, FBPE Executive Director Zana Raybon discusses the importance of earning a Professional Engineer license, the education, exams, and experience necessary in order to obtain a license in Florida, and answers questions from students. The talks include a PowerPoint presentation with several short videos provided by NCEES. 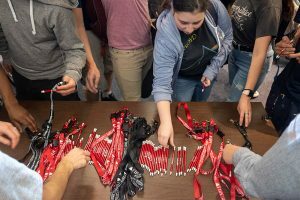 Following events at colleges of engineering, students receive FBPE-branded lanyards that include USB flash drives loaded with information about PE licensure in Florida, copies of recent FBPE Connection newsletters, information and reference material on NCEES’ Fundamentals of Engineering exam, links to FBPE’s website and social media pages, FBPE contact information, and more. See photos from other outreach events in the Events and Conferences section of the FBPE website. One of the missions of FBPE is to increase public awareness of professional engineering licensure, and to educate and promote licensure to engineering students at colleges and universities around Florida. If you would like an FBPE representative to speak to your class or student event, please email publicinfo@fbpe.org.